Yunnan means ‘south of the clouds.’ It’s one of the most exotic areas in China with its Tibetan influences from the north and influences of the colourful culture of peoples of Laos and Burma to the south. There are many diverse ethnic groups. Of China’s fifty-five officially recognized ethnic minorities, twenty five can be found in Yunnan and about a third of Yunnan’s population are not ethnic Han-Chinese. Dali is another very popular place to visit for its walled old town and attractive traditional architecture. Here you can encounter interesting ethnic cultures: Bai, Yi and Hui in particular, and the place is renowned for its fine handicrafts. Jinghong is an alternative to Lao or northern Thailand for its minority villages that are scattered outside the town. In the north of the region, Deqin is a high (3,500m) Tibetan town near to Meili Snow Mountain. In itself it’s not particularly inspiring, but it is located near to some fine treks to the Mingyong Glacier, Yubeng or along the Mekong River and is the place to come if you want to go and explore some of the surrounding Tibetan villages. Shangrila (formerly Zhongdian) is another largely Tibetan town, aspiring to compete with Lijiang in attracting tourists. However, less touristy, it still keeps its charm and the beautiful surrounding countryside make it well worth the visit. It has a lovely Old Town and the recently restored Tibetan Songzanlin Monastery is impressive. Here you are welcome to visit local people and many of them have opened up their homes to tourists. You pay a token amount to cover the cost of the food and you get the chance to spend time with the family and learn a little about their lives and culture. Kunming is the provincial capital, nicknamed “Spring City.” Well connected with flights to cities around the world and Asia, its Wujiaba Airport just outside the city is due to be replaced by a new one in 2015 which will be one of the biggest in China. By train there are lines going to Hanoi in North Vietnam, central China via Guizhou and Chengdu in Sichuan. They are all fantastic journeys with spectacular scenery. Kunming is connected by buses that go to Luang Prabang in Laos and to Vietnam. A speedboat runs three times a week on the Mekong River between Jinghong in southern Yunnan and Chiang Saen in Thailand. From the 5 star Grand Park Kunming to more modest and charming inns and small guesthouses, there is a vast range of accommodation available. 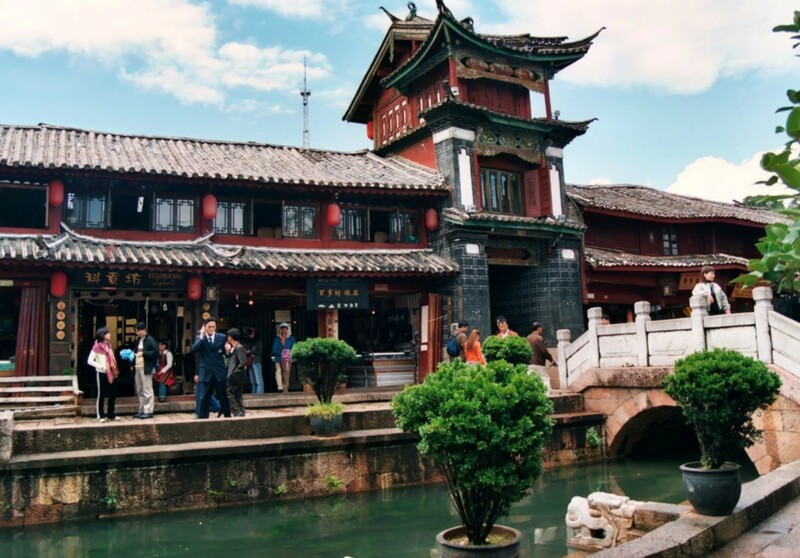 In Lijiang for example, Baisui Inn in the Old Town is a renovated 300 years old Naxi traditional house that offers great accommodation in a peaceful yet central location. If you want to taste Tibetan village life without the discomfort, The Old Farmhouse, in Hala Village which is not far from Shangrila offers every comfort in carpeted rooms that come well-equipped floor heating and 24 hours hot water. Lots of places serve the popular local rice noodles which come steamed with vegetables, meats, and usually a raw quail egg. Shi Ping County is famous for its tofu and Xinping is renowned for sauerkraut. Spicy food is the norm. RuBing is a special Yunnan goat cheese and is one of the only two cheeses traditionally produced in China. Soft and mild, it generally comes served fried with vegetables, mushrooms or meat. ‘Grandmother’s Potatoes’ (LaoNaiYangYu) are another Yunnan delicacy that’s a spicy version of mashed potatoes with green onions. SuHongDou is a kidney bean dish where the beans are deep fried to a crisp. Special to Yunnan is a game called ‘Go’ and the best Chinese stones are Yúnzǐ, Yunnan stones. You can pick up a set of these at the flower and bird market in Kunming and if you are interested, it’s possible to visit the factory that produces them near Kunming. You are spoilt for choice with souvenirs like the burned wood carvings that are typical of Lijiang; yak horn combs; Naxi clothing (again Lijiang) and all types of clothes; Yunnan coffee and tea and handmade embroidery also make great gifts. Yunnan is one of the most exotic and fascinating areas of China. From trekking to see the beautiful Tiger Leaping Gorge, to exploring the Old Town of Lijiang or meeting the Tibetan and other ethnic groups to learn about their culture, Yunnan has plenty to offer everyone. Image Credits: Wikipedia and China International Travel.